It’s no secret that gift shopping can be difficult. What do you get someone who already has everything without opting for a impersonal gift card? And with Father’s Day 2018 just days away, the pressure to find the perfect present is on. But fear not, Burger Lovers- we’ve compiled a list of some of the best gadgets to give any dad, father figure, or really any grill enthusiast this summer. Read on to see our top picks! This kit from AMZ BBQ Club has everything a grilling enthusiast father could want and more. 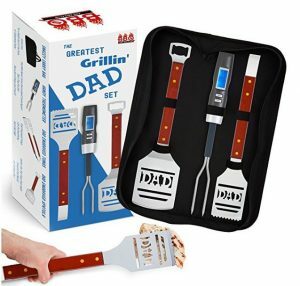 This four piece set contains tongs, a digital thermometer, and a spatula all wrapped up in an easy to carry case. The metal on the tons and spatula are molded to read “Dad”- so there is never a question who it belongs to. And as an added bonus, the spatula’s handle even doubles as a beer opener! Looking for an option that is a little more gender neutral (or a little less “dad”)? Check out this set of grilling tools from Sennecko here. 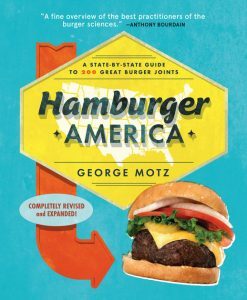 George Motz is unofficially America’s go-to Burger aficionado. 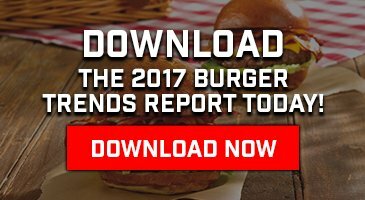 The photographer, filmmaker, and Emmy-winner has again returned to the open road to explore 200 of the best Burgers sold across the country from a multitude of different restaurants and shops. This is a great addition to any foodie’s collection, and a fantastic source of inspiration for the chef. He’s gonna make you a Burger you can’t refuse. 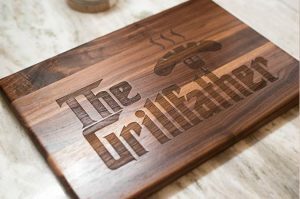 If you love mob movies, cooking, and puns, this cutting board is for you. Naked Wood Works allows buyers to select the size and type of wood they want for their cutting board, and it is crafted to fit those specs. Not a fan of The Godfather? There are other pop culture-inspired designs to choose from. You’re already using Schweid & Sons Brand Burgers, but how about really making them your own? 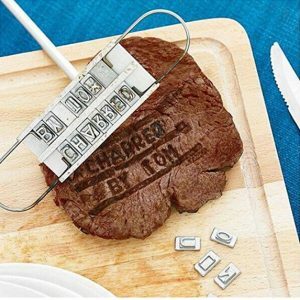 Let the world know you’re the one cooking up the Very Best Burgers with this branding mold. This iron includes 55 letters and spaces so you can change up what your meat says again and again. At such a cheap price, this is a fun gift that anyone should add to their kitchen collection.